THE FUNDAMENTAL BATTLE OF ALL TIMES is who establishes the truth, God or the world, God or Satan, God or each person? This battle will increase even more in the next few years before the second coming or Jesus Christ. Lucifer said, I am God, I decide the Truth, and Saint Michael the Archangel replied with his name: “Who is like unto God?” Original Sin was the same deception: “But the serpent said to the woman, "You will not die. For God knows that when you eat of it your eyes will be opened, and you will be like God, knowing good and evil" (Gen 3:4-5)” Many modern philosophers led us into the “COPERNICAN REVOLUTION” of not seeking anymore reality and the truth outside of ourselves by way of our five senses but inside of ourselves, as if each one of us “will be like God”. “Abandoning the investigation of being, modern philosophical research has concentrated instead upon human knowing. …” (No. 5; Encyclical Letter: Fides et Ratio; John Paul II; 09-14-1998). In this fierce and underhanded battle, it is very important to be “wise as serpents” and not just “innocent as doves” (Mt 10:16)! THE WORDS “LOVE” AND “MERCY” ARE USED BY THE CULTURE OF LIFE AS WELL AS THE CULTURE OF DEATH. “Satan disguises himself as an angel of light” (2Cor 11:14). We as Catholics are very fortunate to have the guidance of the One True Church that Jesus Christ founded, the Catholic Church, with “the means of sanctification” in the Sacraments and the fullness of the Truth from Divine Revelation through the guidance of the magisterium of the Church (VCII: LG 8) by which the faithful may be configured to Christ. THOMAS AQUINAS TELLS US: “RARELY AFFIRM, SELDOM DENY, ALWAYS DISTINGUISH.” Few Catholics today distinguish the difference between changing Church discipline and changing Church doctrines which come from God Who is the immutable and absolute Truth, and thus can never be changed. And still more, a great number of so-called Catholics today do not distinguish between deepening and expressing better in human language the Absolute Truth which cannot changed, with changing the Absolute Truth (Modernism, etc.)! The Church is like the waiter but God is the Cook; the waiter must not change the meal prepared by the divine Cook but must deliver the Truth, as God has revealed it, to the clients, to the faithful. WE ARE LIVING IN ONE OF THE MOST CONFUSING TIMES IN THE HISTORY OF THE WORLD AND OF THE CHURCH; this confusion has been well orchestrated by the puppets of the father of lies (Jn 8:44) especially in recent times, due to the great lack of prayer and almost total disregard for sin. But notwithstanding this grave danger, very few Catholics even have a copy of the Catechism of the Catholic Church (CCC) for adults, in their homes, the great gift that Pope John Paul II gave to us in 1992! And even worse is the fact that a great number of catechists in the parishes do not have a copy of this precious gift of our catechism first published in 1992. Do we believe that God gave us the 10 Commandments and all of Divine Revelation only to torture us or for our true good?!? Do we trust ourselves or do we trust our Creator Who loves each of us immensely?!? “Jesus, I trust in You!” – Saint Faustina. “A new cultural climate is developing and taking hold, which gives crimes against life a new and-if possible-even more sinister character, giving rise to further grave concern. … There is an even more profound aspect which needs to be emphasized: FREEDOM negates and destroys itself, and becomes a factor leading to the destruction of others, when it no longer recognizes and respects its ESSENTIAL LINK WITH THE TRUTH. When freedom, out of a desire to emancipate itself from all forms of tradition and authority, shuts out even the most obvious evidence of an objective and universal truth, which is the foundation of personal and social life, then the person ends up by no longer taking as the sole and indisputable point of reference for his own choices the truth about good and evil, but only his subjective and changeable opinion or, indeed, his selfish interest and whims.” (No. 19; EVANGELIUM VITAE; To the Bishops, Priests and Deacons, Men and Women religious, lay Faithful, and all People of Good Will, on the Value and Inviolability of Human Life; http://www.vatican.va/holy_father/john_paul_ii/encyclicals/documents/hf_jp-ii_enc_25031995_evangelium-vitae_en.html). “The Church's teaching on marriage and on the complementarity of the sexes reiterates a truth that is evident to right reason and recognized as such by all the major cultures of the world. MARRIAGE IS NOT JUST ANY RELATIONSHIP BETWEEN HUMAN BEINGS. It was established by the Creator with its own nature, essential properties and purpose. No ideology can erase from the human spirit the certainty that marriage exists solely between a man and a woman, who by mutual personal gift, proper and exclusive to themselves, tend toward the communion of their persons. In this way, they mutually perfect each other, in order to cooperate with God in the procreation and upbringing of new human lives.” (No. 2; Congregation For The Doctrine Of The Faith; Considerations Regarding Proposals To Give Legal Recognition To UNIONS BETWEEN HOMOSEXUAL PERSONS; June 3, 2003; http://www.vatican.va/roman_curia/congregations/cfaith/documents/rc_con_cfaith_doc_20030731_homosexual-unions_en.html). Chastity and homosexuality: CCC 2357-2359. This essay by Pope Benedict XVI, then Cardinal Joseph Ratzinger, can be found in Italian at the Web Site of the Osservatore Romano (http://www.osservatoreromano.va/it/news/la-pastorale-del-matrimonio-deve-fondarsi-sulla-ve#.UzU6atfqUxA), but when one clicks on the English version at this site, one receives the following message: Error 404 - Page not found. The Letter of the Congregation for the Doctrine of the Faith concerning the reception of Holy Communion by the DIVORCED AND REMARRIED members of the faithful, Sept. 14 1994, had a lively echo in various parts of the Church. Along with many positive reactions there were heard also not a few critical voices. If it is allowed to be able to change one doctrine of the Church, in principle, the door is opened to change all the infallible doctrines of the Church. BEHOLD THE DESTRUCTIVE HIDDEN POISON IN THE NAME OF CHARITY (FALSE), misguided compassion! Cardinal Walter Kasper is part of the “C8”, the Council of eight wise cardinals (?!?) instituted by Pope Frances! Jesus told us: “What therefore God has joined together, let not man put asunder” (Mt 19:6; 5:32)! These words of Christ are thoroughly explained by the teachings of the Church (CCC 2331-2336). “I DO NOT IDENTIFY WITH the expressionless faces of those who recite the Rosary outside the clinics who practice interruption of pregnancy” [“l’interruzione della gravidanza”] (an interview published by “Quotidiano Nazionale”, May 12, 2014). IT IS UNBELIEVABLE that these words were pronounced by the new (12-30-2013) GENERAL SECRETARY OF THE ITALIAN EPISCOPAL CONFERENCE, MONSIGNOR NUNZIO GALANTINO! It would be nice if the secretary of the CEI might try to reflect on the words of Blessed Mother Teresa of Calcutta: “I feel the greatest destroyer of peace today is abortion, because it is a direct war, a direct killing - direct murder by the mother herself. … Because if a mother can kill her own child - what is left for me to kill you and you to kill me - there is nothing between”. Our Lady of Akita, Japan (1973): “The work of the devil will infiltrate even the Church in such a way that one will see CARDINALS OPPOSING CARDINALS, bishops against other bishops. The priests who venerate Me will be scorned and opposed by their conferees… churches and altars sacked, the Church will be full of those who accept compromise …” (http://www.miraclerosarymission.org/akita.htm). Father, “Sanctify them in the truth” (Jn 17:17)! The Truth, tied to the cross of Jesus here on earth, is uncomfortable! “THE DREAM OF ST. JOHN BOSCO” of the two pillars indicates to us the great importance of staying very close to Jesus in the Eucharist (while it is still possible) with our Rosary in hand, especially today. SIN HAS ATTACKED THE “HIERARCHY OF VALUES”. Man wants to be God. Man’s body revolts against his soul, and the soul capitulates and rejects the primacy of the spirit. Thus bodily feelings dominate the mind, and both dominate the spirit. Morality become topsy-turvy, confused and relativistic. The natural law of God is rejected. Unnatural relationships become fashionable and claim the same rights as natural relationships. Divine revelation and law are rejected; our civilization declines and falls. RELATIVISM, according to Pope Benedict XVI, is "the most profound difficulty of our time." (http://popebenedictxviblog.blogspot.it/2005_05_01_archive.html). In his homily at the Mass preceding the conclave that quickly elected him Pope Benedict XVI, then Cardinal Ratzinger said: “Today, having a clear faith based on the Creed of the Church is often labeled as fundamentalism. Whereas relativism, that is, letting oneself be "tossed here and there, carried about by every wind of doctrine", seems the only attitude that can cope with modern times. WE ARE BUILDING A DICTATORSHIP OF RELATIVISM that does not recognize anything as definitive and whose ultimate goal consists solely of one's own ego and desires.” (http://www.vatican.va/gpII/documents/homily-pro-eligendo-pontifice_20050418_en.html; http://www.ignatiusinsight.com/features2005/colson_relativism_may05.asp). Today a great number of Catholics want, with the blessing (at least tacitly) of the priests and bishops, A CHRISTIANITY WITHOUT THE CROSS AND WITHOUT THESE “GUILT COMPLEXES” THAT WERE CALLED SIN. And thus very few Catholics today go to confession and many go to the psychiatrists which costs much more than to confess ones sins to a priest, who often, unfortunately, is not found in the confessional in the churches. But many who still go to confession , do not understand anymore what is a sin according to the CCC, because very few priests today take the risk of their primary job to help the souls identify and cure the mortal sicknesses of the soul, mortal sins! The secretary of the Congregation for Clergy, Archbishop Mauro Piacenza, has lamented that many faithful no longer confess their sins. Archbishop Piacenza told Vatican Radio (June 5, 2009) the sacrament of penance has been experiencing a "deep crisis" for decades. Piacenza, an official for the Vatican office on clergy, says FEWER PEOPLE DISTINGUISH BETWEEN GOOD AND EVIL, and as a result do not go to confession. The archbishop said in an interview that if faithful do not have a sense of sin, they might "CONFUSE" CONFESSION WITH "THE COUCH OF A PSYCHOLOGIST OR A PSYCHIATRIST"! He says the Vatican plans to publish this year (2009) a “vademecum for confessors and spiritual directors”. Dear brothers and sisters, “THE TRUTH (of God!) SHALL SET YOU FREE”! 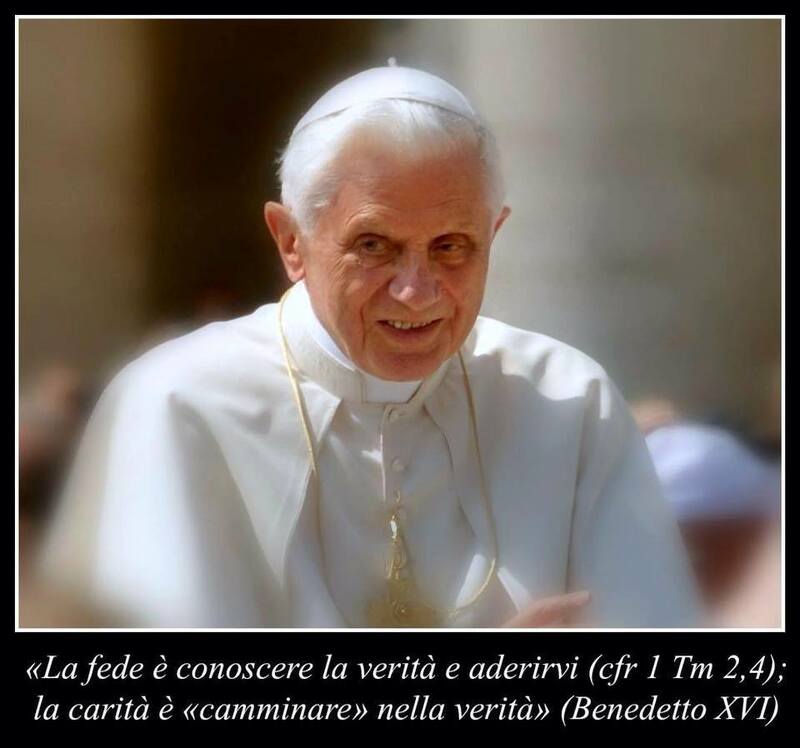 charity is “to walk” in the truth” (Benedict XVI).